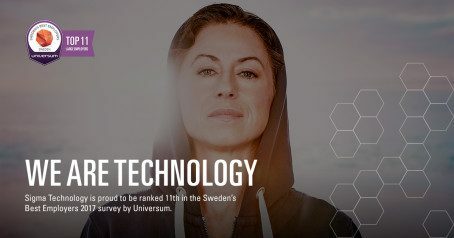 Every year, the most popular job portal in Sweden, Universum, publishes an annual ranking of Sweden’s Best Employers. The listing is compiled based on employees’ assessment of their current employer in three aspects: internal identity, satisfaction, and loyalty. About 3,000 companies are nominated yearly in over 57 markets by students and professionals, and only 50 of them appear on the ranking. Sigma Technology has been occupying various positions in the Best Employers survey for six years. For two years in a row, Sigma Technology reaches an outstanding result—11th place in the listing. We believe that this achievement reflects our effort in creating a fulfilling workplace—engaging our employees in challenging projects based on cutting-edge technologies, contributing to the social benefit together. “The foundation of a credible Employer Brand lies in a strong and clear culture that employees live in. By creating a good environment for employees, the employer gets the opportunity to retain and attract the right talent, which, in the long run, builds a strong and credible employer brand,” says Claes Peyron, Managing Director at Nordics, Universum. For more information, please contact Carl Vikingsson, carl.vikingsson@sigmatechnology.se. Sigma Technology is a part of Sigma Group and is a global supplier of product information, embedded solutions, and offshore development. We are experts with a passion for technology and information, and take pride in delivering quality and constantly improving our deliveries. Our philosophy is “Local Drive—Global Strength”, therefore we have offices worldwide to be close to our customers.